As many of you know, every August I return to my studio in England to make kiln-formed glass. I only have a few weeks in the studio, so I try really hard to work efficiently! This year, that means taking pre-orders for my new cast glass MEGA Meeples (along with other exciting Meepley goodness) for postal delivery in September, or in-person delivery at Essen Spiel in October. The idea of the MEGA meeples was created as a backer reward for Rahdo’s kickstarter, and there seemed to be interest in them after the campaign ended, so I plan to make a limited number of them while in England and I have set up a listing in Etsy so people can easily pre-order them. In addition to making the MEGA meeples, I have budgeted some time in England to make Meeple coasters and little square bowls and little sushi dishes and a celebration plate! I introduced a few of these at Essen last year, and they were very popular, so I thought I’d offer them on the pre-order system this year so everyone can get a set in red/yellow/green/blue. Or if you have other colors in mind, you can totally customize your set of square or sushi dishes–I have lots of fun designs! I can also make larger pieces, so if you’re interested in discussing that, please contact me! I will continue to be able to make the Meeple jewelry (all those designs which are listed on my Etsy shop) from my studio in Malta, so there’s no need to pre-order those. However, new Purple and Turquoise meeples will be born from water and glass in August, and I can start incorporating them into jewelry pieces in September! 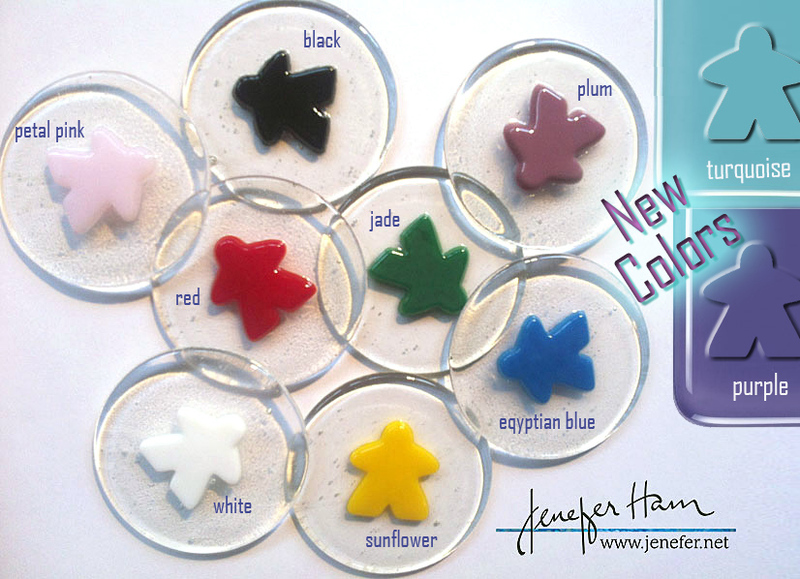 NEW purple and turquoise meeples will be added to the available colors! I anticipate that I will have a little extra time to make some “not pre-ordered” pieces to show and sell at Essen, but to avoid disappointment and to help me plan my making time accordingly, I’d like to say thank you in advance for placing your pre-order by July 26th =). 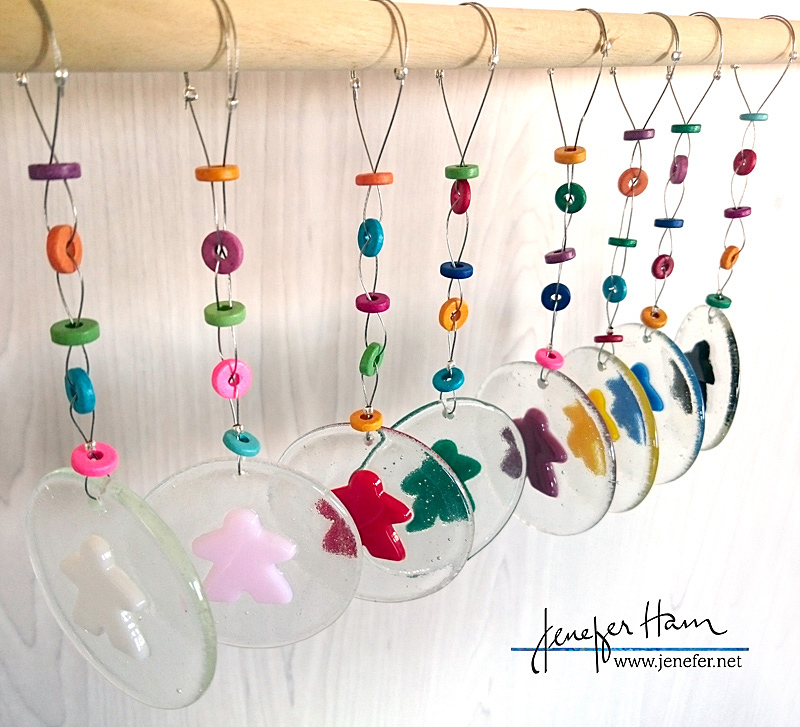 I realize this is about 2 months ahead, but it will help me allocate kiln space, and make sure I have all the right colors and quantities of glass at the ready so I can hit the ground running once I get to my studio. And it might ease your mind as well, knowing you’ve got your gift list (or at least part of it) sorted, hehe! Let’s end with a puppy photo. You deserve a bit of Gerts and Daisy! 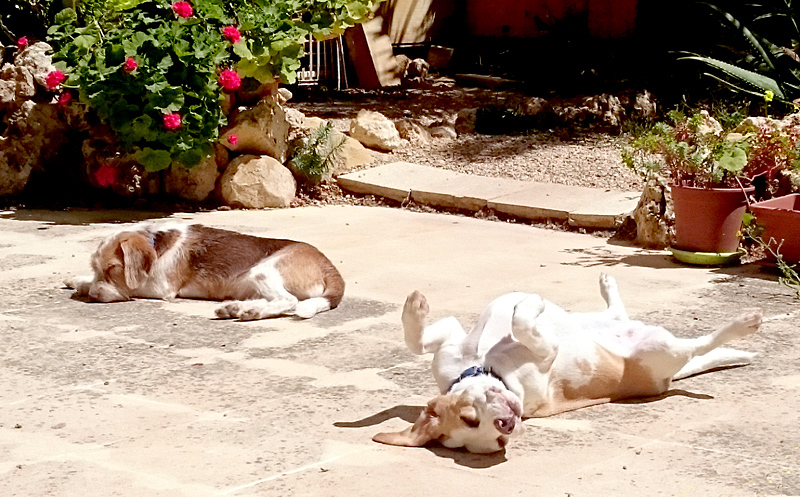 …it’s a dog’s life and they do it so well! So when are you going to start making Beagleples?